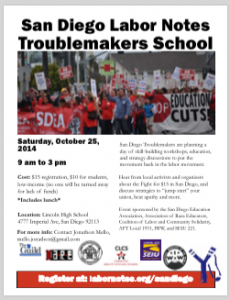 On Saturday, October 25th union members, community leaders, and student organizers gathered at Lincoln High School to attend the San Diego Troublemakers Conference, hosted by Labor Notes and the Coalition for Labor & Community Solidarity (CLCS). From the San Diego Free Press. This entry was posted in 2014, 2014 Events, Labor News & Events, San Diego News & Events, Solidarity. Bookmark the permalink.